While I’ve been away I’ve been frantically collecting links, and now it’s time to give them some freedom from their little cages. But not before I’ve mentioned that EU forums are now live (and fairly ugly), and there’s a dev IRC chat tonight (which I can’t make, of course!). But before I get into those in more details, here’s what’s been catching my attention over the last week. Thulf experimented with posing as a quest giver for 40 mins, giving out quest rewards and everything. I should do this. His experiences made me smile and it was a great idea. Gaarawarr has taken a look at the Order welcome back quests, and produced a guide to them that nudged me into checking them out, so hopefully it can do the same for you. And, lastly Tufmudda has produced his recipe and timing for cooking a chicken while fighting in the Lost Vale – the challenge is now out there for you to post your own recipes that use in-game timing! As you can see, I’m still a little behind on my reading, but catching up by the day! Idris the Warrior Priest is now at rank 16 (nearly 17) and stomping through Barak Varr with a giant hammer playing whack-a-mob. And as always, gaming is now taking precedence over blogging. Ok, first – changes to the sidebar. I’ve taken out the RSS feed from the Warhammer Herald in the US and replaced it with a bunch of WAR-related twitter feeds. You can now check out the latest from Andy, James, the WAR Herald, Josh and Paul on the right-hand sidebar. Go me! (Also means I can un-follow them, sneaky, huh?). Secondly, GOA have posted another guide in their series. This time to being a guild leader. It’s a sore topic for me at the moment, but I enjoyed reading the guide – go read it and let me know what you think. I like the idea and I like that they’re adding these guides, it’s a bit of extra content that people seem to be overlooking a little. Yes, we all feel we know these things, but still, not everyone is as old and jaded as some of us (thankfully!). Thirdly, Phoenix Red over at Warhammer Alliance is undergoing a fab experiment. To play Warhammer Online using the community to determine things. They’ve already voted for a class to play, server type to play on, how to xp (ie. scenario, PQ, oRvR) and he’s got his first report on the game up now. The speedy levelling and variety of Warhammer allow these kinds of player-run achievements (which is what I think is really going on here). It’s a bit like Syp‘s challenge to level in RvR only. Maybe we’re getting a bit stir-crazy and looking for ways to make things more fun by giving ourselves some limitations… but it’s definitely something worth reading over at Warhammer Alliance. Other things that were popular are the new /sit /lie and other new emotes, but this was probably more due to the fact that there is currently no way to get up again after doing them, they’re also still possible while mounted. Hilarity ensued. Hey it’s called a TEST server for a reason . First, a welcome to Swisshammer (more Euro blogs!) and Kiss My Bolter. Have any ideas on how to improve the chat system in game? MJ is taking feedback in a thread on The Vault. GOA haven’t provided us with an EU server status page yet, so Penlid@Freddyshouse has produced one of his own. Quick Youtube vid you should go watch – Paul Barnett’s finished Hamtoucher’s ‘WAR(here we come)’. Rock Paper Shotgun has a blistering review of My Dream Job: Babysitter. Maybe it’s because I was drunk when I read it but that made me laugh a lot, thanks guys! British gamer stabbed over forums dispute? This is just plain wrong. We’ll never be hosting a forum! And on a crime theme, but with absolutely nothing to do with gaming at all, a tyre-slashing grandmother in Germany has been ordered to knit jumpers as a punishment! Games Radar has a list of ten gaming moments you wouldn’t want your family walking in on. It made me grin, and includes any form of playing World of Warcraft. Meanwhile, Fidgit has a list of 10 moments that changed videogaming forever. It also includes WoW, as well as the Portal song. You think Warhammer plundered from World of Warcraft and you haven’t read all the history of both games to know exactly how they line up for borrowing from one another? Well, how about this? World of Warcraft are now putting out a miniatures game. No kidding. Let’s all get behind the Rock, Paper Shotgun list of 10 things all PC games should do. They had me at Alt-Tab support. Just in time for Fallout 3 (what do you mean you didn’t know it was out in about a month?? ), The Escapist notes that UGO have provided a crash course in Fallout. KOTOR MMO to be revealed later this month according to CVG. And RF Online is closing in Europe and North America on 10th November. Wired has its review of Warhammer Online up now, it’s pretty damn positive. Obviously we haven’t been linking to every review of the game, we figure if you’re reading this blog, you probably like the game, but this one came in a bit later than others, so stood out in the feed reader. Kiziko has an interview with Josh Drescher, it’s very funny and he also talks about capital cities and city sieges. Drescher: Those people are very kind! 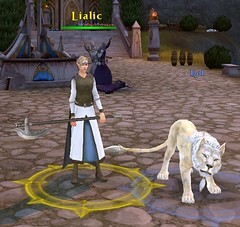 The White Lion is one of the most unusual classes in the game. It’s an elf with a big two-handed axe, so right from the start there is a sense of disconnect. Elves don’t use axes, dwarves do! Far from being effete academics, the lore says that White Lions are tough mountain warriors – not forest dwellers. And although they have trained war lions to hunt with them, they also wear lionskin around their shoulders as a mark of accomplishment. So these are not your average Tolkeinesque elves, they’re a more savage culture. And from an MMO point of view, a melee dps class with a pet is quite uncommon in itself. Pets are usually used to tank by ranged classes. So how does the Lion work out? It’s a fun class. Even at low levels, with a nice renown axe my White Lion can put out a lot of damage very quickly. When I’m on form, I have no trouble dashing in and out of combat and downing some annoying squishy before heading back to the shelter of my local tank. The pet is mostly well behaved and does what it is told, there are issues with the UI and pathing that I’ll touch on later but I’ve been more impressed than frustrated with him. Pet control is in three parts. 1. You can set how much you want to micromanage the pet’s targets by selecting aggressive (pet attacks anything in range), defensive (pet attacks anything that attacks you), or passive (pet only attacks when it is ordered to attack). These settings have become quite standard in MMO pet classes. I usually put mine on passive, although I have found in RvR that setting it to defensive means that it goes after healers if no one is actually hitting me. So it has a regular PvE mobs aggro list. This may make the lion more useful than I am but I don’t mind if it is making me look good. It dashes off behind a rock and comes out chasing a shaman. 2. You can manage where it is by selecting between follow (pet follows you), stay (pet stays where it is) or attack (pet runs off and attacks your target). All of these can be mapped to keys. I usually stick the pet on follow, using keybinds to get it to attack things. 3. Pet abilities. 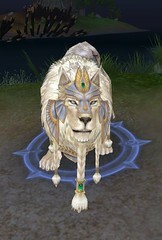 The lion has a number of abilities which include a variety of dps moves, a snare, some debuffs, and a taunt. You can micromanage these by mapping them to keys (or using mouse-clicks) or you can leave the lion to use them itself which it tends to do on every cooldown. The trick is that it doesn’t have access to all of its abilities all of the time. You can train your lion to take different stances (trained to threaten, trained to kill, trained to hunt) and each stance gives it access to a different set of abilities and also gives a buff to you. So for example, trained to threaten (the pet tanking stance) gives the pet a taunt, a snare, and an attack that debuffs enemy armour. It also gives the pet’s master 5% extra crit chance. So there is a LOT of scope for micromanagement if you want to control absolutely what your pet is doing at all times. But it works well enough without. I’ve been using trained to threaten for RvR and hotkeying the snare and letting the lion do the rest on its own, but I’m definitely not done experimenting yet. The White Lion doesn’t have much utility. And some of the utility that it does have (like the snare) is provided by the pet. I would have preferred to have my own snare, but this way does force you to work with the pet as best you can. What they do have is a lot of solid damage moves. The three talent trees do encourage different styles of play, which is a design I like to see because it gives a class more replayability. Path of the Hunter has solid dps boosts, such as a tactic to increase attack speed by 50%. With a big slow axe, I expect that to put out some big AP-free numbers. It also encourages you to set the pet on a different target and has abilities which let both pet and master work together. But the primary focus of this line is on AE damage. Path of the Axeman is all about letting the pet tank while the elf puts out huge single-target damage. It emphasises attacks from the side or rear and contains the classes only healing debuff attack. There’s a nice baseline ability which ignores all armour when you attack from behind which is handy for those times when you absolutely have to chase down a tank. And Path of the Guardian is all about enhancing the pet’s ability to get to a target and deliver huge damage, while toughening the elf so that she is better able to tank. It has an ability that allows the pet to break crowd control which will be familiar to anyone who played a hunter in WoW. For getting in and out of combat quickly, the White Lion has access to a speed boost that doesn’t consume AP as well as sprint, and there is a Pounce ability that you can spec for which allows a leap into combat over a short distance. It also apparently negates falling damage if you Pounce while falling, which may be a bug. Sometimes the pet interface disappears completely. This can be resolved by resummoning the lion but the resummoning is on a 15s timer which starts when you dismiss it (or it dies). It can be hard to track where the pet is at all times, and it is sometimes slow at coming back to heel when called. Pathing is generally good — in particular when you jump off something, the lion jumps with you. But occasionally the lion will stand around or take a route you hadn’t predicted. I’ve been pleasantly surprised by the pathing though. I was expecting worse. It’s quite usable. I’ve never really felt I was good at playing melee in PvP. It is much harder than playing ranged, you don’t always have much time to pick our your targets and you don’t get as good a view of what is going on around you. And you always need to run in before you can start attacking. Ranged have a much larger target choice and more time to see what’s going on. And of course with the White Lion, you may need to be picking out two targets at a time, one for you and one for the pet. One of the things I wanted to do with my White Lion was try to get a bit better at playing melee. So I have been levelling her mostly in scenarios and open RvR. I find with melee that RvR is much more of a rollercoaster. When it goes well, it REALLY goes well. The numbers are flying, targets die quickly, you get to charge after a wounded tank and kill them in one blow and you feel ‘well ‘ard’. I’ve had scenarios where I had loads of killing blows and a few solo kills to my name. I’ve had some where I felt as though I was dying constantly and being nothing but a burden to the rest of my team. I have decided that it is probably normal to feel like this and that I’m probably no worse than lots of other people. It is more challenging to play a class that you know you aren’t particularly good with. I’m still hoping that with more practice that will change. I am really enjoying the White Lion, now into Tier 2 and looking forwards to picking up Pounce. The big axe feels dangerous. The lion feels useful and well trained unless I mess up its chances. There’s still a lot to learn. And the most important thing: what do you call the lion? The command is /petname <name>. I named mine Kol after one of my old In Nomine RPG characters that was an angel of judgement, a man of few words. What did you call your pet? Is he more useful than you are? White Lion – who doesn’t love a pet cat? Wir haben es getan. “WAAAAAAAAGH!!! !” Es soll dann auch T-Shirts geben. Jippie!. Here’s a cool video from Leipzig about living cities, showing a Bright WIzard running around Altdorf. Oh, and Josh Drescher gives a commentary! If you’re going to dress up, pick a cool class to dress up as. Here’s a good example from Leipzig. What’s the future for Warhammer Online after September 2008? Paul speaks at Leipzig and says there’s a 3-year plan currently in place. Sausage and Sauerkraut – lunch is good at the Games Convention it seems. Lunch is important. More photos from Leipzig can be seen here (incl. Age of Conan booth babes – because I’m good to you – arbitrary). Player vs Developer compares the WAR trailer to the WoW one, both released at Liepzig. Rock, Paper, Shotgun also mentions them in the same breath, but gets to use the word ‘phwoarhammer’ – we’re depressed we didn’t think to use that one, so credit where it’s due. Is it just us though, or was that a handful of Order chars taking on an entire Destruction army. Nerf!! And, of course, Warhammer Online wins Best Online Game of the show. Neurotic women are more likely to blog. No comment. Actually, that reminds me, there’s a new livejournal community for WAR-ladies. Ablegamer takes a look at Warhammer Online from a different perspective – what does it have to cater for the disabled player. This is my current favourite review of Warhammer Online – it covers a lot of ground, while not being too in-depth, and it sounds like a group of friends honestly discussing the game. This I like. We loved the gamespy pre-NDA impressions of WAR, here’s their actual beta review. MMORPG.com has an interview from GenCon Indy with Robert Mull, Community Relations Director for Mythic. There’s a short intro here, and then a longer video. Useful tools for Warhammer Online. WarDb (basically Thottbot for Warhammer Online) if you want all the info/spoilers broken down, and the combat parser (though if I am going to use that kind of thing I’d rather have one on my desktop than have to go through a website). This is Massively’s collection of videos showing the /special emotes for each race. They’re what WAR has instead of /dance to give you something amusing to do while you’re waiting for people to run back from the graveyard. Ok, this may be down right now but it’s supposed to be back online today so I’ll link it anyway. Tiny Adventures is a D&D Facebook app – it lets you create a char, equip them and set them off on an adventure. Sounds fun to me!